Photographer Bill Cunningham outside Skylight Clarkson Sq during New York Fashion Week on July 15, 2015 in New York City. I miss Bill Cunningham. There. I said it. I miss opening the Thursday and Sunday pages of the New York Times and seeing a whole cross-section of humanity, courtesy of Cunningham's photos, that had become a documentation of how New Yorkers lived and what they wore. It's fitting, then, that Cunningham's posthumous memoir, Fashion Climbing, should be published during New York Fashion Week. The fashion photographer was always on the streets outside the shows (where the people were often more interestingly dressed than the people on the runways), darting, quick as a sparrow, to get the best looks. And best looks did not automatically mean most expensive looks: "It didn't matter where you were coming from, or who you were going to be, or were supposed to be — if you were wearing something that said something about that day or that time, he was interested," says Hilton Als, from the New Yorker. Cunningham did not become who he was supposed to be — at least in his family's estimation. Born into a strict, middle-class Roman Catholic family in the suburbs of Boston, William John Cunningham was destined for something traditional. "My family had a whispering thought that I'd be a priest," he confides in Fashion Climbing. "What Irish Catholic family doesn't dream of its eldest son being a priest?" 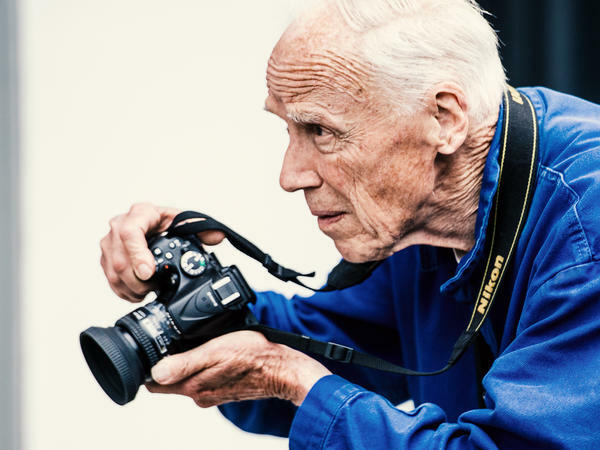 That didn't happen, and lucky for the rest of us, Bill Cunningham worshiped at fashion's altar instead — although throughout his life, he'd remain a devout church-goer. He dropped out of Harvard after a few months and eventually got a job as a stock boy in Boston, first at the august Jordan Marsh emporium, then at the very luxe Boston branch of Bonwit Teller. The Harvard dropout with a passion for fashion thought he'd be less of an embarrassment to his conservative family if he wasn't right in front of them, so he moved to New York. At age 19, he opened his own hat salon (he'd begun making hats at an early age) and set up shop on the ground floor of a townhouse in the West 50s. He created fanciful whimsies under the name William J — no last name, in deference, again, to his family. He shuttered his atelier in the early 60s because, he said, "women had stopped wearing hats." He did freelance assignments for a few newspapers and magazines, which, in later years, included Details and Vibe. But it was his work for the New York Times that made him an icon. Cathy Horyn was chief fashion critic for the Times for 16 years, and became close to Cunningham. She knew how he worked. "He kept an ongoing file in his head," she says. "If he saw people wearing, say, spotted furs, or over-sized parkas or a different pattern in their knits. He'd just keep filing that away in his mind until he had enough to do a piece for the Sunday page." He decided what went on the page, Horn says. "I can't imagine an editor or a photography editor saying 'Bill would you look for this?' I mean, he'd just laugh. People knew not to say that." And, says the New Yorker's Hilton Als, being beautifully dressed didn't mean you'd automatically attract Cunningham's attention: "He was very democratic in his approach to this," Als says. "He did discriminate visually; if it wasn't interesting, he didn't photograph it." So he photographed black kids on skateboards. Gay couples, arm in arm, on a Sunday stroll. Church ladies in Harlem in their magnificent hats. Bicycle messengers and secretaries going about their work. They all made the cut alongside grande dame Brooke Astor and philanthropist David Rockefeller because of their style. The documentary "Bill Cunningham: New York" has a scene in it where a scrum of photographers descends on a Paris limousine in which the serenely beautiful Catherine Deneuve is seated in back. Everyone, that is, except Bill Cunningham. "You're not photographing her?" someone asks, off-camera. Cunningham shrugged: "She wasn't wearing anything interesting." He was definitely more interested in the end result of how the clothes were put together, not the person wearing them. When he wasn't shooting on the street, he was often taking pictures of swank events populated by the city's upper crust. He may have moved through mansions and known the difference between a Piaget and a Patek Philippe, but Bill Cunningham lived like a monk: His bed was a piece of plywood with a mattress that sat atop file boxes filled with photos and negatives. Bill Cunningham died on June 25, 2016, after having suffered a stroke. When they went through his papers, his family found the manuscript for Fashion Climbing. So it, and his thousands and thousands of images of New Yorkers of all stripes and incomes, are his bequests to the city: a chronicle of a half-century of style by a man who lived to seek beauty in all its manifestations.